“We are not witches but if the church and state insist, then let us be the descendants of all the witches they could not drown.” This is a line from a poem recited by prominent Irish women in a new short film to repeal the Eight Amendment. In 2016, Ireland and Malta are the only countries in Europe where abortion is illegal. Although there has been uproar in recent years, especially since the death of Savita Halappanavar in 2012, the constitution has not been altered. In February of this year, The College View reported that 88 percent of young voters were in favour of legalising abortion. This raises the question of why has nothing happened, especially when abortion and the Eighth Amendment have come to the forefront of Irish politics in recent years. The Catholic Church still have a certain amount of control over the country, where women’s bodies are seen as homes for the foetus they carry. It was not long ago that women were “cleansed” before returning to church after giving birth. We may pat ourselves on the back for being the first country to legalise gay marriage by public vote, but we must also look at the forgotten women who travelled abroad, alone and scared, to have a medical procedure that is not available in our own country. Between January 1980 and December 2015, at least 166,951 women and girls travelled from the Republic of Ireland to access abortion services in another country, according to statistics provided by the IFPA. In 2015, 3,451 women and girls in Ireland, or just over nine a day, travelled to the UK to access abortion services. At least nine women every day go to the UK to get an abortion. Just last month, a Twitter account was set up by two Irish women to chronicle their abortion experience. @TwoWomenTravel soon began to trend in Ireland and caused national debate. Many celebrities, including James Cordon, showed their support for these two Irish women. Most of the tweets from @TwoWomenTravel were directed at the Taoiseach, Enda Kenny. However he did not reply to any of the tweets. The tweets and images resonated throughout the country, as they highlighted the all too harsh reality that faces so many women throughout Ireland. They highlight something that may even be viewed as a luxury for some women, who cannot afford to travel abroad for a medical procedure. In 2016, there is no reason why abortion should not be legalised in Ireland and why women shouldn’t have the rights to their own bodies. 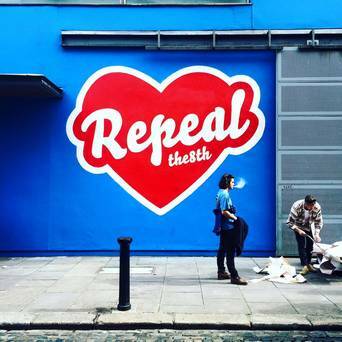 The Repeal movement is causing waves throughout Ireland, so perhaps this will lead to a referendum and an end to the Eighth Amendment.